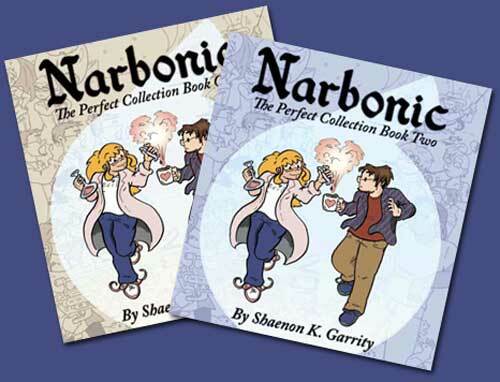 Shaenon: Before Skin Horse, I drew a strip called Narbonic. The two-volume print collection of Narbonic sold out of its first print run earlier this year, because it’s awesome. Now I’m running a Kickstarter campaign to do a second printing. Please check it out, tell the world, and dig on all the sweet backer rewards. The campaign begins now and ends on October 31. Thank you! I didn’t see a link. It’s https://www.kickstarter.com/projects/250007708/narbonic-the-perfect-collection-reprint right? Good song. Brings back fond memories of mad science. Lemon-fresh Pledge! Oh, and my Zombie Gnome should arrive Tuesday… Hoping for Zombie Flamingos! Whoops, forgot to say: PLEDGED! Would it be possible for backers at some lower level to get ebook copies of the stretch goal book(s)? We’ll see. Shaenon may feel really generous if this one hits $25k or $30k. That can totally be arranged. Might I also suggest slip book covers for the books, and a level that they can be bought for those of us who purchased the books from the previous Kickstarter? That would be tres awesome. I agree, Cloudster. My books from the previous Kickstarter are still in good shape, but a book cover or something for them would be a welcome addition to my shelf. What I actually meant was one of those slightly-larger-than-the-books boxes that you slip the books in to, but nice dust jackets would be really cool also. And dust jackets could ship flat. LOTS of spiffyness could ensue! Sorry, yes, that’s what I meant, too, Cloudster. I’d love to, but Liz, who made the slipcovers for the previous printing and Skin Horse 1-3, is busy right now. I wanted to pledge for the $10 ebook tier but it wants to add $20 for shipping to the UK. Seems a bit high even taking brexit into account!? It doesn’t seem to be possible to edit it back down – the only non-$20 possibility is to say shipping to the US. The U.S. Post Office’s rates have gone up quickly and steadily over the past several years, and they no longer offer a “media mail/book rate” option. On many of our foreign orders, we only break even after all the shipping costs and fees come into play. My point is that I’m rather confused that there’s a question about shipping at all for what is (unless I’m even more confused than that) an ebook-only tier. Drat! The ebook tier shouldn’t add shipping, but Kickstarter doesn’t let you edit a tier once someone has pledged to it. I’ll have to email them and see if they’ll fix it for me. You might also see if you can change it to specify if it is PDF only, or are you going to offer it as epub or mobi? I’d repurchase it if I could get it as epub. Just do what any responsible adult would do under the circumstances: lie. Select US shipping, pay no extra fees. In unrelated news – woohoo, I’m exactly backer #100000000! What do I win…? This almost makes me disappointed to still have my originals in good condition. @paulagee66 Well, you could always buy them for someone else, spread the love around a bit, ya know? I mean, I’m not trying to suggest WHO you could buy them for. Could be a perfect stranger, in fact. I wouldn’t judge. Three words. Little. Free. Libraries. When I was a young man who had not yet realised that I was, in fact, a young not-quite-woman-but-let’s-go-with-that-for-the-sake-of-simplicity, I grew up through the 90’s and 2000’s oblivious to such new-fangled nonsense as these “internet comics”. I was more a “go outside and set things on fire” sort of child. I am pleased to say that Narbonic was my first ever webcomic. I came across it years after it had finished, read it all at once over about a week, utterly captivated, then moved on to Skin Horse. I didn’t really like SH quite as much at first, but once I got further into the archive it grew on me quickly and took pride of place in my fledgling webcomic reading list where it remains to this day, many years and hundreds of new titles later, crowding together with the newcomers to (successfully) vie for my attention and trample my hopes of ever completing my masters degree. Narbonic will always have a special place in my heart for bringing me into the world of webcomics. My own copies are well-loved, but still in good enough condition that I have no need to replace them, alas. For those who do not have the perfect collection, I heartily recommend it. They’re well made and quite durable, and the contents are as entertaining now as they were when they were all those years ago. Pledged. Being able to kick back from time to time and read Narbonic was, for me, one of THE saving graces of a couple of tough years. So, for the first time, I’ve actually pledged to something on Kickstarter – because I have been in awe since the first time I read it, and I REALLY want my own copy. What about plushie ur-gerbils as a stretch goal? NB: I need to examine my finances before committing to a pledge. PLEDGED like my insanity is on the line! I missed the first Kickstarter, SO stoked to get in on round two! Is there a chance of a pledge level for just one of the two main books, plus the stretch goals material? I already have the 4-6 omnibus. Pledged, and as it was processing you broke $8K. Conga Rats! I have made my pledge. I don’t have the 1st printing of this edition, and while I have the original 6 books, there is enough extra stuff available here that I’m happy to throw some money at you folks. If/when you do reach stretch goals for the Reactor Reader and/or the Victorian story, is there any chance of a backer level that’s just the extras? Shipping a whole set of books for just the extras seems….a bit excessive. Yes, especially for those of us overseas (see above comments about the price of postage wiping out your well-deserved profits). I first read Narbonic after a recomendation from someone on Crooked Timber. Initially it was just silly and fun, but then it got really deep and dark, and I ended up crying by the end. Anything that doesn’t make you cry by the end isn’t worth reading.